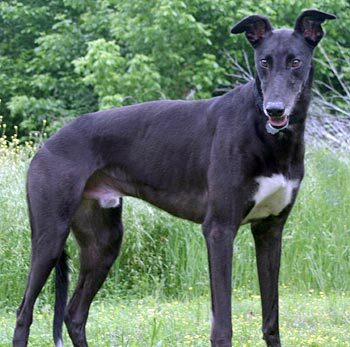 Steeler, aka Boc's Steeler, is a 2-year-old black male born May 30, 2007. His sire is Pacific Mile and his dam is Amazeme Amber. 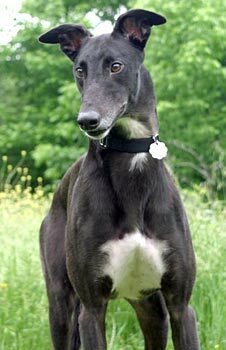 Steeler's 11-race career started December 13, 2008, at Valley Race Park in Harlingen, TX, and finished there on February 13, 2009, when he fell in the first turn on the track. Steeler suffered a career-ending injury to his left shoulder diagnosed as a medial collateral sprain by Dr. Doug Lange of the Dallas Veterinary Surgery Center. Steeler was fitted for a DogLeggs Hobbles sling to stabilize his shoulder and wore it for 6 weeks. He then received physical therapy, and his shoulder now appears to be healed. Now to just find his forever home! Steeler’s introduction to cats: Steeler’s initial response was: curious, sniff, move on, responding to voice command. Later as he saw more activity, his attention grew more intense. Now, when he comes out of his crate, he’s on full alert, looking for cats. Steeler is not considered cat tolerant. We will see how he does with small dogs at a later date. Steeler is a very happy and playful boy who gets along well with other dogs. I have never known a greyhound with such enthusiasm for toys! He takes them from the basket one at a time and stockpiles them. He also lives up to his name of Steeler by sneaking by an open cabinet or drawer and “stealing” an item and running proudly away with it. Perhaps he could be trained to pick up the house and yard?! Currently we are working with Steeler on a few tricks: back up, lie down and fetch. He did not pass his cat test, but he is extremely eager to learn and please his human friends. 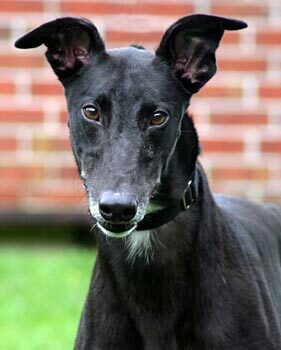 If you love tail-wagging “leaners” who speak fluent Greyhound, then Steeler is the dog for you! He is greyt on the leash and has adapted quite well to his crate. Steeler is very curious and loves to follow me around the house to make sure he doesn’t miss anything interesting! He is fully house-trained but will occasionally counter surf or inspect a wastebasket, so we are working to correct those behaviors. Steeler is quite happy to sleep on a cozy dog bed near your own human bed at night. In summary, Steeler is an 80-pound black puppy with a beautiful tuxedo coat and a lot of love to give. Nothing would make him happier than coming home with YOU today!